Thousands of mineworkers downed tools in South Africa on December 4 in a strike, demanding better safety in mines. The strike was called by the National Union of Mineworkers (num) after three mineworkers were killed in separate mine accidents on December 1, putting the death toll in mines at 202 this year. 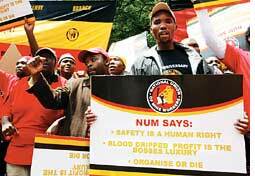 "We are losing mine workers on an almost daily basis," said Lesiba Sheshoka of num. The protest affected 60 companies involved in mining gold, platinum and coal. In South Africa, about 200 mineworkers die every year--a rate much higher than that of the us, where mine deaths are much less than 100 a year. The nation's mines are among the world's deepest and most labour-intensive.